One of the proudest moments in modern Swedish history was when Nelson Mandela visited Sweden in 1990 – the first country outside of Africa – after his long imprisonment. Sweden’s relations with South Africa are unique. As far back as the 1960s, a country-wide Swedish anti-apartheid movement arose. In the early 1970s, we were the only western country to give official political support to the anti-apartheid movement, as well as massive financial support. Standing up to security threats is a joint responsibility and one in which the value of solidarity comes through. I commend South African efforts to help address conflicts on the continent. South Africa’s contribution to the UN force in the DRC is a case in point. In Sweden’s neighbourhood, too, new threats have emerged. In Ukraine, we have seen Russia illegally annex the Crimean Peninsula. We have seen the terrible situation created by the escalation on the ground in eastern Ukraine, with no doubt that Russian-backed separatists are responsible. Since spring last year, more than 6 000 Ukrainians have been killed and one million people have been internally displaced. Once again, we must remind ourselves of the necessity of international security based on principles such as non-aggression, respect for international law and human rights, and the right to territorial integrity. Swedish-South African cooperation in trade and investments – for example in ICT and energy and mining equipment – is an important vehicle for future success for both of our countries. Jobs are in equal shares the foundation of human dignity and of economic growth. Some 18 000 South Africans are currently employed by Swedish companies. 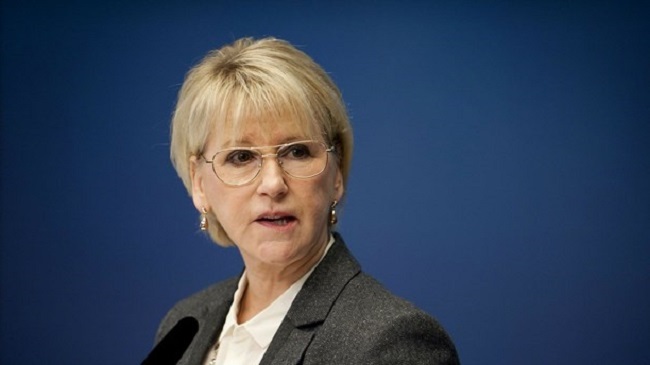 One of the new Swedish Government’s first decisions was to recognise Palestine as a sovereign state. The main reason was that the criteria of recognition were fulfilled. Through our decision, Sweden wants to give new dynamics to a halted peace process, facilitate a peace deal by making the parties less unequal and instil hope in young Palestinians and Israelis that peaceful co-existence is possible. Human rights are also women’s rights. Striving towards gender equality is not only a goal in itself, but also a precondition for achieving our wider foreign and security policy objectives. In this context, I warmly support the prominent role South Africa has played in promoting the role of women within the framework of the African Union. The AU Summit decision to designate 2015 as the year for the empowerment of women is a much-needed initiative.